Indiana Campgrounds and RV Parks Eastern, Central and Southern IN. The RV Park and Campground links are below. If you know of any Indiana RV Parks or Campgrounds not listed here, please submit them and we will get them listed in the directory. About 20 minutes north of Fort Wayne at Beautiful Blue Lake, this family orientated campground has activities for the whole family. Quiet family campground in a country setting. Our sites will hold campers or RV's up to 50' and all pop-ups and tents. Just 15 minutes outside of Fort Wayne, Indiana. Only 25 miles east of Indianapolis and ½ mile north of interstate 70, Jellystone Park is near attractions and events in Indianapolis and central Indiana. RV camping just outside of historic Logansport, Tall Sycamore sits on the banks of the Wabash River. Leave your motorhome or travel tailer amongst picturesque rolling hills, north of I-70 halfway between Dayton, Ohio and Indianapolis, Indiana. We are a family owned campground and campers ourselves. We can accommodate anything from 7O ft. Rigs to tents. Tour the 1839 red-brick home, called the "Grand Central Station of the Underground Railroad". 75 wooded acres with water and 20/30/50 AMP. Our campground is 40 miles North of Fort Wayne, IN and is on 70 acres with 4000' of lake frontage on Messick Lake. Campground located 50 feet from gate 4P on Co Rd 1000 E directly across from Indianapolis Raceway Park. The Indianapolis KOA is the place to be on race weekends for the Indy 500, Brickyard 400 and Formula One. Family oriented camping getaway in a country setting but close to Indianapolis and many other local attractions. RV Park open is open year around. 24 hour access through the automatic security gate. Two miles south of the Indianapolis, Indiana beltway on Highway 37. Within a 7-mile drive, downtown, Indianapolis 500 mile race track and more. Closest rv camping to Verizon Wireless Music Center. We are on 65 acres in Boone County, Sugar Creek Township. In scenic Southern Indiana, just 15 minutes from Lake Monroe Reservoir. On 100 Acres in the heart of beautiful southern Indiana. For every season of the year, there's always something to do and see in scenic Brown County ..and there's no better way to enjoy it all than RVing and camping. From roomy pull throughs to cozy cabins, our goal is to provide you with generous accomodations to make your stay in scenic Brown County more than memorable. Lake Rudolph Campground & RV Resort is just 7 miles south of Interstate 64 in historic Santa Claus, Indiana. 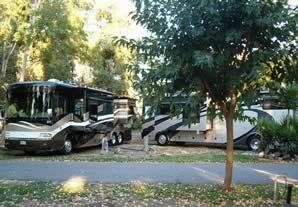 Finding RV campgrounds In Indiana including the Eastern, Central and Southern regions.